Although my time at Ivuka was very stressful there were also many wonderful gifts that came to me during my time there, some related to Ivuka and some not. I know how important it is to bring balance into my life and to acknowledge both the dark and the light sides of every situation. This is my way of reminding myself that even in the midst of the darkness there is always light and sometimes it takes removing myself totally from the situation to fully realize that there was in fact many brilliant memories to share as well. Last Saturday I went for a visit to Alice and Justin’s. I go every Saturday after my Thriller Practice session in Kicukiro. 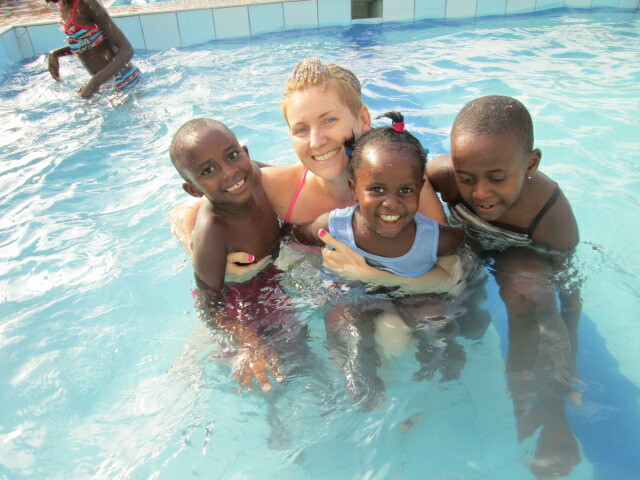 I took Abbey and her cousin’s Nancy, Tetea to the swimming pool (Koga au Piscine, as Abbey says!) with the help of Oliva, the housekeeper and my friend. We swam for a bit, all 3 not good swimmers at all so I had my hands full and we only lasted about 30 mins before it was time for a treat on the deck. I ordered us some Fanta and Ifiliti (fries) and they ate it up like little vaccums. Each one with a big glob of Mayo on the side of their mouth! Even Oliva accepted my offer this time which is uncommon! These three little sweeties are bright spots in my life here in Kigali and offer me a bit of what I feel I am missing by not being in contact with my own nieces. But I know that my nieces are doing well and having all kinds of experiences that these three are not and may never have so my small amount of time here with them is worth it if I can offer them a few experiences that they can hold onto in their hearts, just as I will hold them in mine. 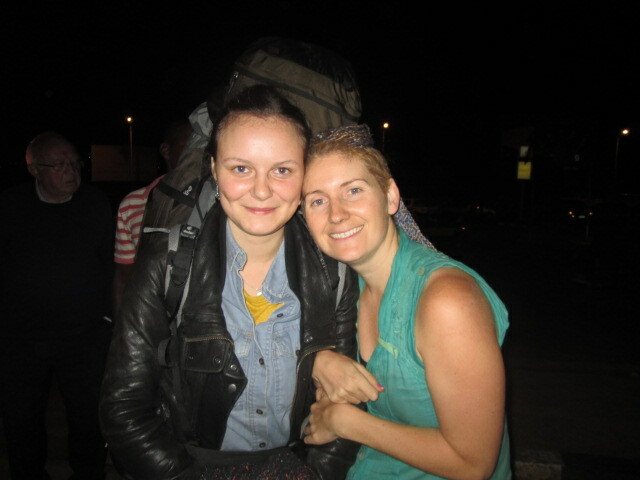 My friend Alex, whom I lived with for a month and had a wonderful bond with, left for Paris on Friday. Bitter sweet as her leaving opened up the room that I now live in! She and I had such great talks and even though she was only 21, she was one of the most confident and courageous woman I know. She offered me insight my own life by letting me into hers. She would come into my room and just sit and talk, let me hear all her frustrations about her day and what she hoped for in the future. I would talk about Yoga and my life, my learning and lessons. It felt like a big sister relationship in some ways but in a completely balanced way, no one was more wise or more experienced. We just shared where we were at and what we knew to be true. She gave me fancy cheese from France and we drank wine together on the porch. When I moved out we stayed connected and met up for dinner, dancing, movies, or to work on her work projects together, which she was very grateful for the help and I the company. I miss her and it is interesting being in her room now that she is gone but we all go our separate ways for a reason. We have plans to do a house swap in 10 years so I can experience Paris and she Cananda! I know we will stay in touch as she holds a sweet little place in my heart always. I love you Alex and am so grateful for our meeting, you were a gift to me on this journey. Thank you again for the poem and funky little African faces! Until we meet again….Bon Voyage Mon Amie! I went to meet the dancers for a demonstration of Thriller at a pottery studio the other day, only find out that it had been canceled. As I spoke to Gilbert on the phone, I remembered that Mohammed’s parents worked at this co-operative. I turned to the people sitting on the curb and said, Mama Mohammed? Papa Mohammed? It turned out that a few moments earlier I had taken their photo unknowingly. 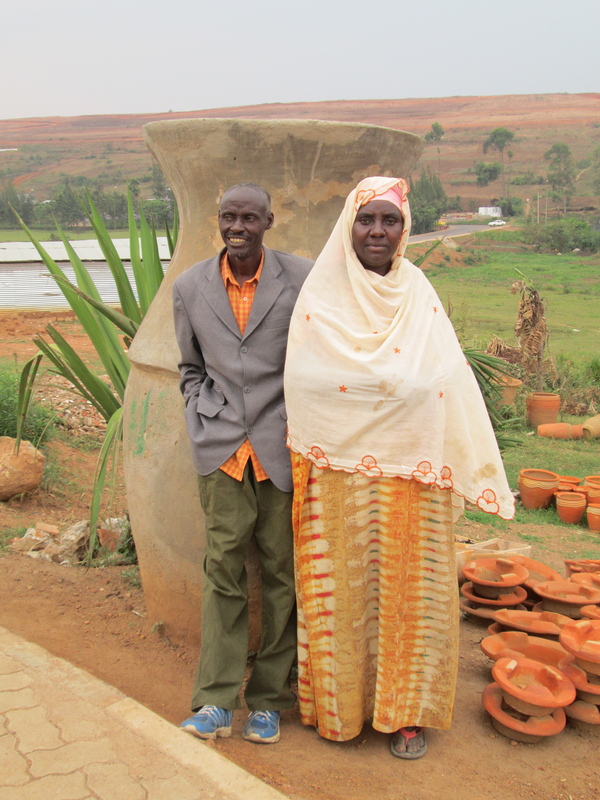 They were leaning together against a giant pot and it was a beautiful image so asked if I could take their photo, Na photo?, to which they said yes. I was so happy to have met them and I shared with them all the photos and video I had of their sons dancing with me on my laptop – Thank you Steve Jobs for going against the grain and believing the impossible, it allowed these two parents to share in the magic of watching their children express joy and happiness through dance in the middle of a field in Rwanda!! They enjoyed it very much, especially Papa Mohammed! I have special bond with Mohammed. To me he is absolutely beautiful in body, mind and spirit. He ALWAYS greets me with a huge smile and says my name “Amanda!” I am not sure what will come of Mohammed after I leave here but I am really drawn to offering support to him from Canada once I have money coming in to do so. He works very hard and shows dedication to himself by showing up for the practices, even when he is ill to, which I tell him to stay at home and rest!! He is engaging and very bright, his spirit shines through him light and inspires me to stay positive during difficult times. Thank you Mohammed, sweet boy! I was standing outside the gates of Ivuka last week taking photos of my laundry hanging on the line against the amazing backdrop of Kigali City and it drew many children to me out of curiosity. Soon they were touching me and hold me hands, asking questions and having photos taken of themselves, which they love seeing on the screen afterward! 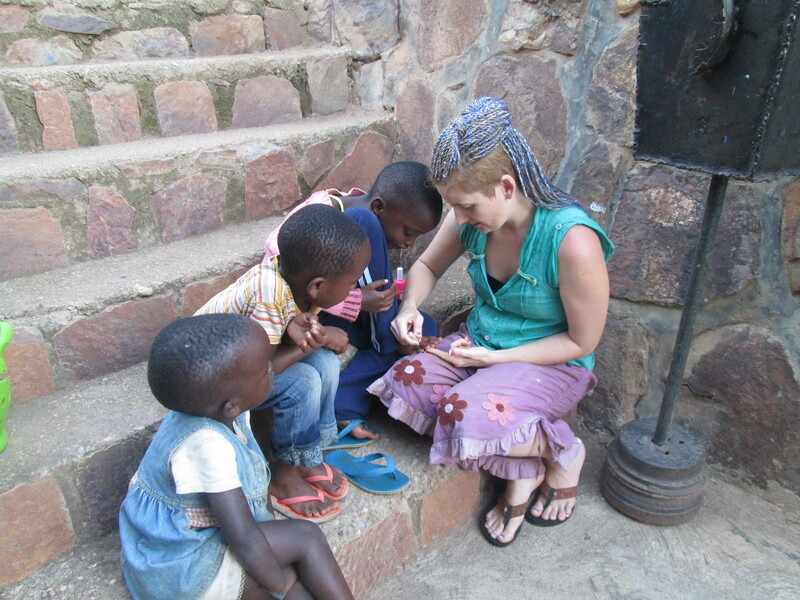 They noticed my finger nails painted fancy and multicolored they seemed really interested. I knew I wanted to offer them the experience of having me paint their nails so we went down to my room and got my two bottles of polish. 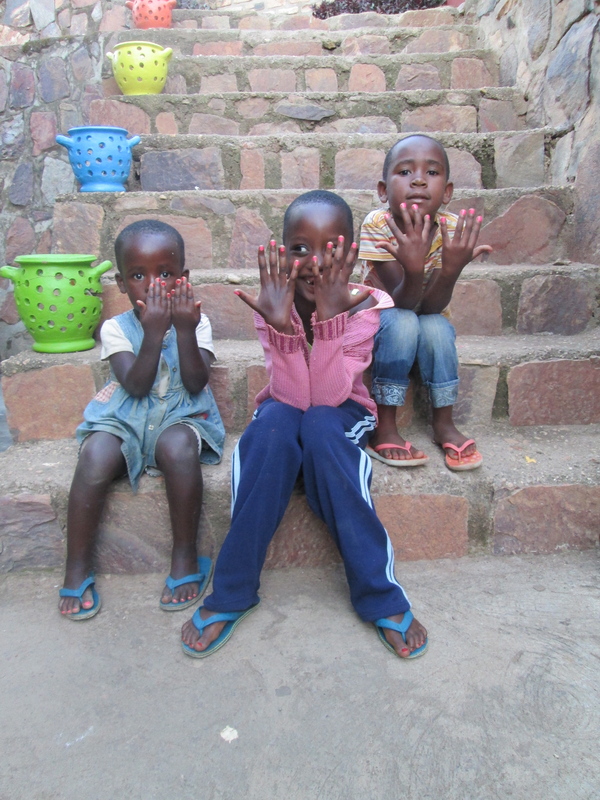 We sat on the steps together as one by one they had their fingers and then toes painted. One of them had missing nails and all of them had dirt caked into their little feet and nails. 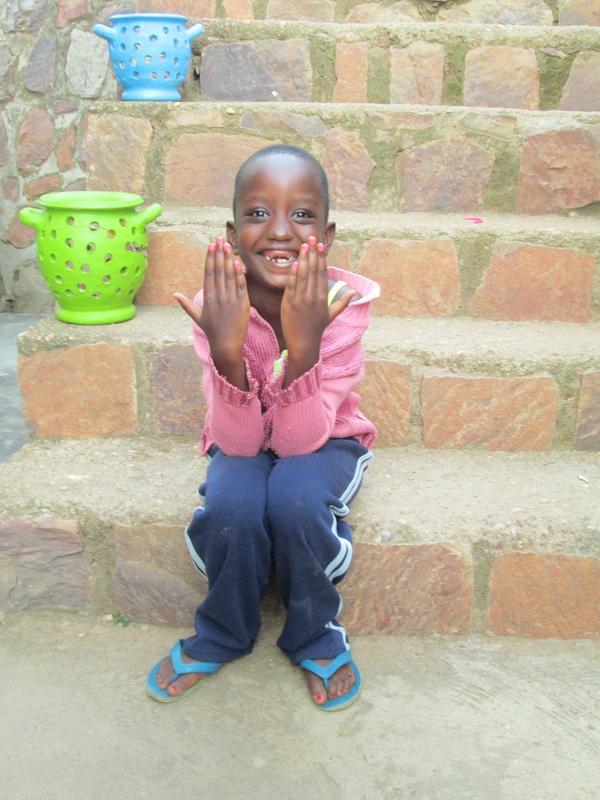 One little boy and two girls now had red and pink nails. 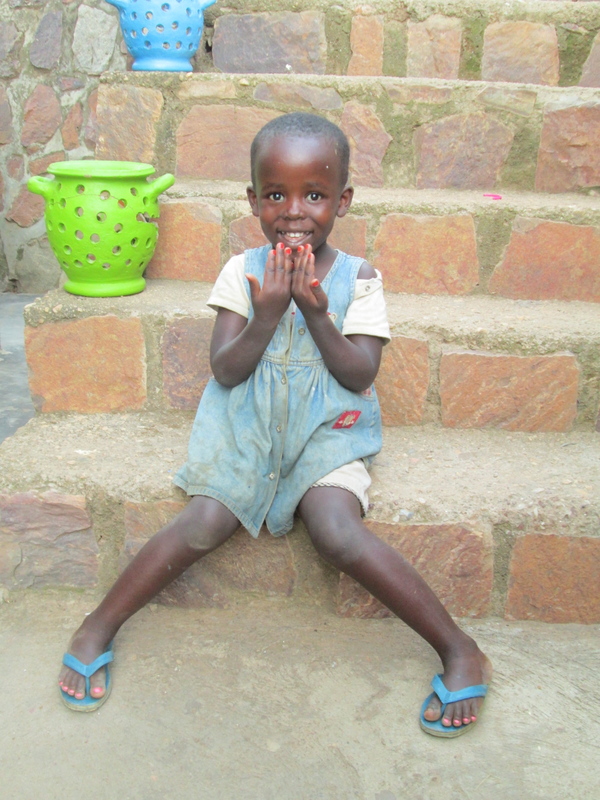 The look on their faces as they admired there new fancy fingers and toes and posed for photos was so sweet.I am constantly reminded of my own beliefs that every little thing counts and makes a difference in the world. Three little children had a 30 min experience with me that brought us all joy, happiness and laughter and that, especially here, changes us all forever. I KNOW it does because I feel it shift. I feel the lightening of their little hearts and I see it in their eyes and feel it in their arms as they look up at me while hugging my legs. This is important work. Someone needs to think that these kids are important and if not me for 30 minutes today, then who and when? These are the types of interactions that are possible here every day, all day and I am here to offer them. Absolutely no one can tell me that what I am doing is wrong, there is no doubt in my mind that this is powerful work and I wish everyone could have the truly human experiences that are offered here. They all deserve to have a big photo of themselves posted for this story – too cute! I saw some of them a few days ago, the little one in the dress came running to me, arms open wide for a big hug and when I looked at her hands I realized it was time for a touch up! 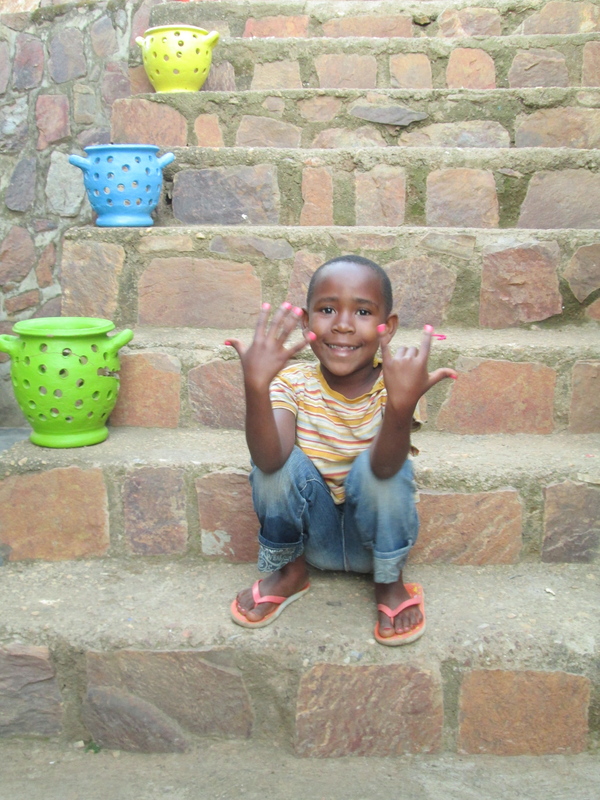 Amini, the young man who lives at Ivuka said “Oh, that’s what they were talking about….they keep coming around asking about painting with you!” These little fingers and toes so covered in red dirt are in desperate need of more than just paint but if I can offer them this one little thing to help them feel good and put a smile on their faces I will. Amini lived with me at Ivuka in a tiny room with no window, so small the door only opens enough to barely squeeze in and lie on the bed, I had it much better than him! We began to chat late at night on the front porch when I would arrive home and I soon realized he was waiting up for me and really enjoyed sharing his story with me. I would listen to him to talk about how his family told him to either go to university to be a doctor, or lawyer or something that he could make a lot of money at or get out. When I say get out I mean out of their life completely. 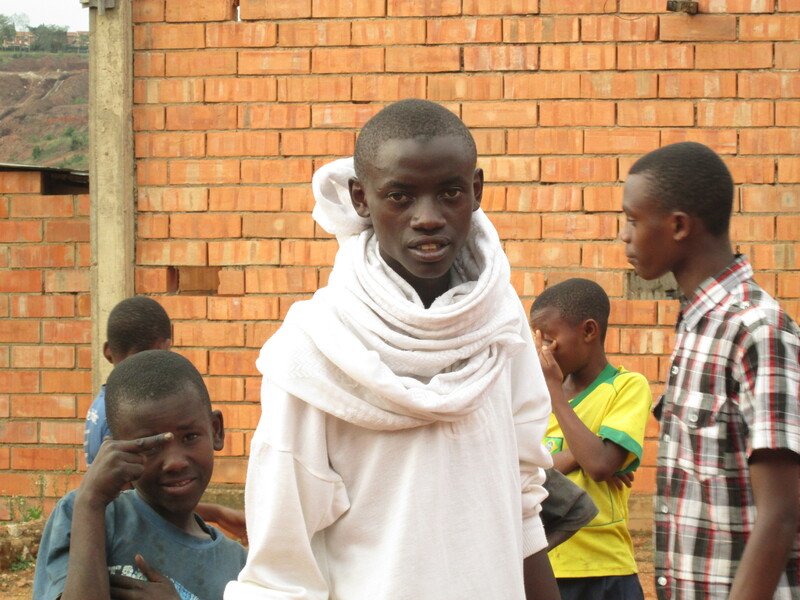 His step mom and his dad have nothing to do with him now because of his choice to be a dancer, artist and follow his love of researching the culture and history of Rwanda. Sounds familiar to me and he is not the only one at this Art Centre alone with this story. I feel most artists, free-spirits, and change makers have to be brave enough stand in what they believe while the rest of society and our families try to keep us down out of fear in their own minds. Amini was not afraid, he was doing it all the way. He does not make a lot of money but the money he does have and how he makes it feeds his soul enough that he can survive living in a tiny, dark room with the support of his fellow outcasts! Art is not well supported in this country and surprisingly neither is dance, even traditional dance. The Government does not support Rwanda being “African” and very much wants it to be as modern ie: as American as possible, which I really dislike and actually find quite disgusting at times. So I am grateful to Amini, Gilbert, Inema , Ivuka and all the others that continue to keep it alive, if it weren’t for them this culture would be lacking in tradition even more than it already is. One night Amini was sitting on the chair waiting for me. We shared a few cookies and he showed me somethings he liked in a People Magazine from 2010 that he had been reading. I was surprised when what he showed me and said was one of his favorite things turned out to be VAMPIRES!! His eyes lit up as he described things he had seen on movies in the past. I asked when the last time he saw a movie was and he said it had been nearly 10 years or so, not since he lived with his parents. I downloaded two Vampire movies for him to watch on my computer; Interview with a Vampire and Twilight New Moon. Then next time I saw him I said “I have a surprise for you!” He was intrigued but I knew he had no idea what I was going to give him. 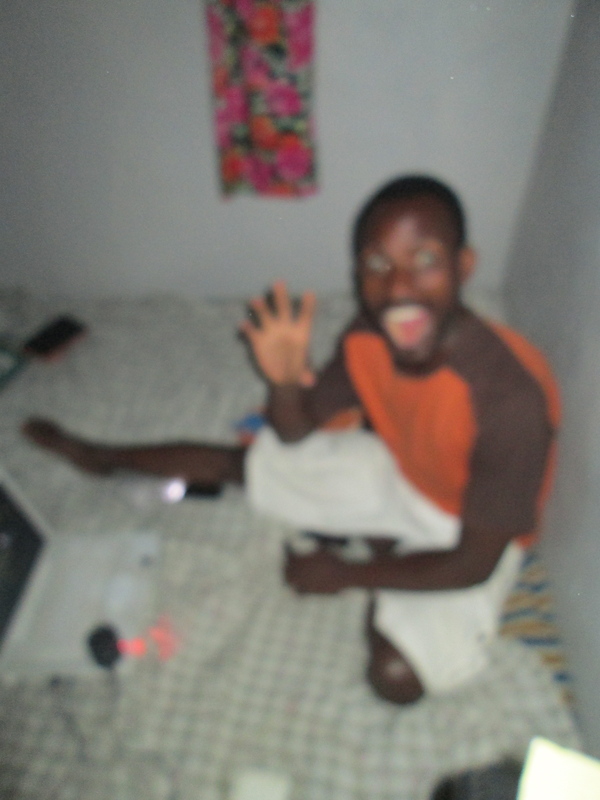 When I handed him my computer, a small speaker and started the movies he literally jumped for joy. “Oh my god! Thank you so much!” he said through a giant smile. He was immediately in his room watching with a friend. I joined them for the beginning of the second movie. I love movies. I use them as tools for reflection and as a way to move emotion through my body. I also use them as a security blanket. I can watch Dirty Dancing 3 times in one day if I am feeling scared, alone or depressed. It never occurred to me that this thing that I totally take for granted could bring such joy to someone. What a feeling it must have been to experience a movie, on a computer in his own room with a friend. Seeing them curled up together watching the screen was such a sweet moment and it will stay with me in my heart as a representation of how the simplest things can really make someone very happy. I love making people happy, especially now that I don’t do it to make myself feel better. I simply share my own happiness of which I have plenty to go around. Now I know my boundaries and trust myself to give only a little and keep a lot for myself because I deserve to be happy to! What ever I can do to let him know that there is support out there in the world for his choices I will and he is an inspiration to me to keep going no matter what other people say or how they try to control me! Thank you Amini! After having been at Ivuka for nearly 3 weeks I ran into the young woman Lizzy who lives on the other side in a different house on the same property. I saw her at Serena Hotel and we started to chat. We had not really seen much of each other or interacted much since I arrived and this was the first real meeting. It was clear right away that we were a match! Sharing our stories, our journeys and our experiences in Rwanda. She was the one who made the hoola hoop that I found when I arrived at Ivuka! 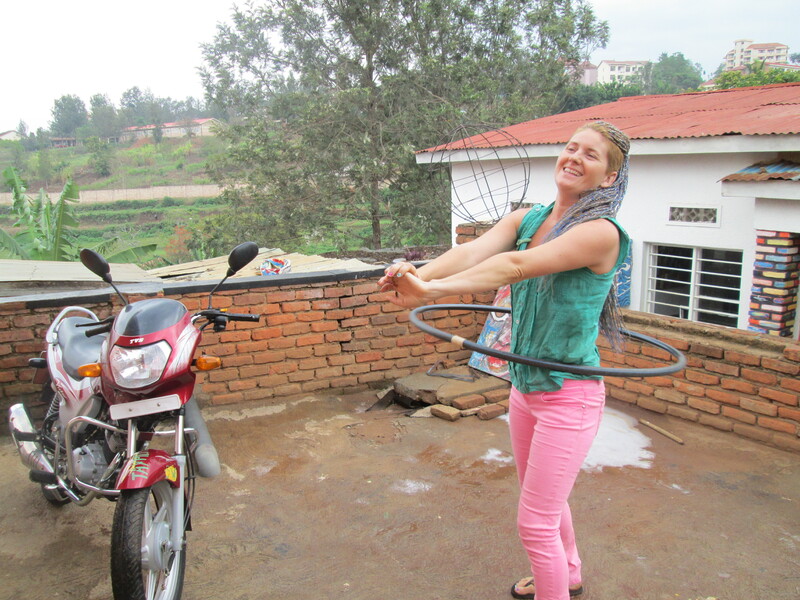 I now have a new partner for the gym and she also has Hoola Hoop knowledge and has done the leg work for how find supplies to make them in Rwanda, so we have teamed up to get the “LOVE HOOP RWANDA” project started this tuesday! 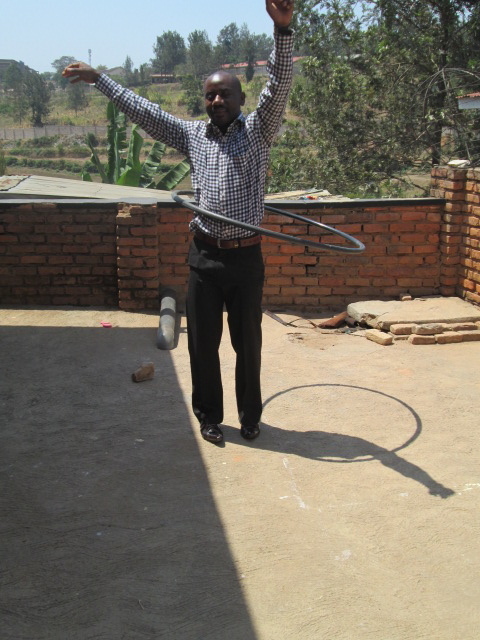 This project is about taking my love of Hooping and movement to the streets and remote villages of Rwanda to share the joy and passion I have for this art form. I want to introduce something new to the people, something that I can then leave behind as an offering and that can continue when I a not here. The plan is to make hoops and cover them with traditional African cloth instead of the usual tape that I use in North America, as a way of bridging the two worlds. I plan to take a photo diary and video and share them with the world as a way to further share the positive energy of this project. Previously I had small company named “Hippy Hoops”, which I made and sold Hoops on line and through word of mouth. I also have started certifications for teacher training and plan to teach when I get back to North America, this project is a way to get myself back into the groove as I let it go while I was healing at the Ashram. Its time to bring the love of hooping back into my life and what a great way to do it! My art projects are starting to take shape, and I have started my first painting and have learned to stretch my own canvases. My project consists of me using all my tools in my spiritual tool box to help channel and move through the stuck emotions that lie within my body. 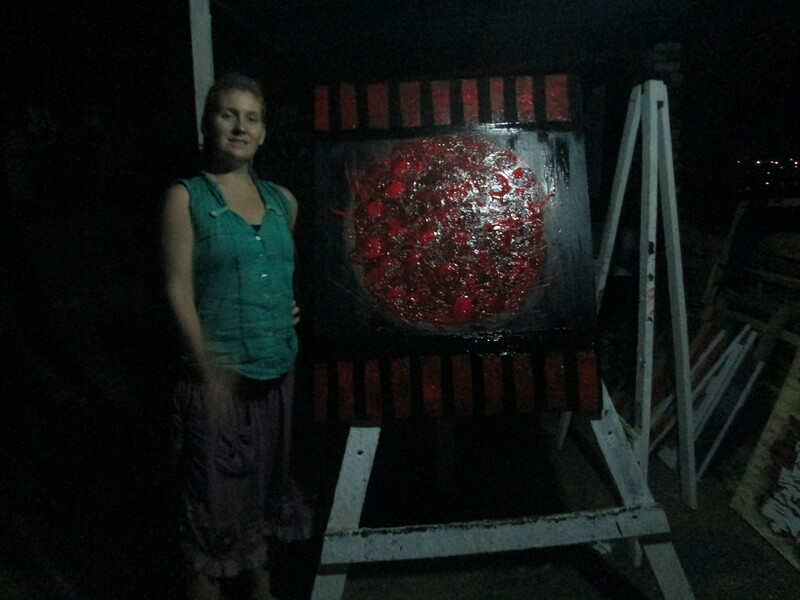 I use chanting, dance, meditation, writing, poetry, music, water, and Asanas to take myself back to the emotions and time that I am working with and then release it onto the canvas. My project is called: Family Series. One painting to represent the Past, Present, and Future of my relationship with each member of my immediate family and then of myself. With one final image to represent the hope for my family unit in the future. I also write a poem for each time period. Needless to say it is an emotional journey but is much needed and I know it is a powerful project, that is why I have been resisting getting started. I am aware that I am afraid so I am kind and gentle with the process, no pushing myself. Now that I am away from Ivuka, feeling more settled in my new space, and have more energy to direct towards this protect I will be able to go to those intimidating places with more confidence. 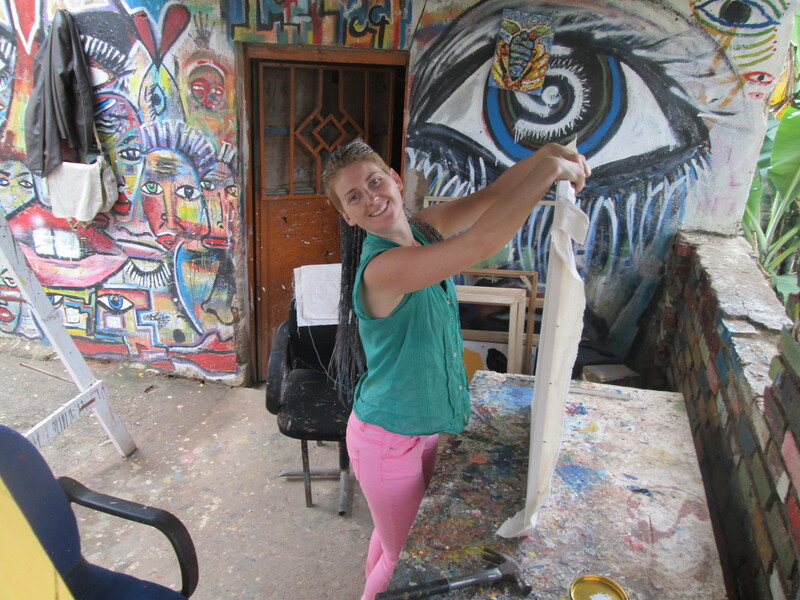 I also met a beautiful young woman name Judy Kaine from New York city and she is doing an art project with HIV patients with the help of the Ivuka Artists. She is so strong, confident and at ease with herself and life, it is an honor to be a part of her work. She has asked me to help with designing questions for the group to facilitate creative expression and to offer any other thoughts or feedback to which I am again honored to do. 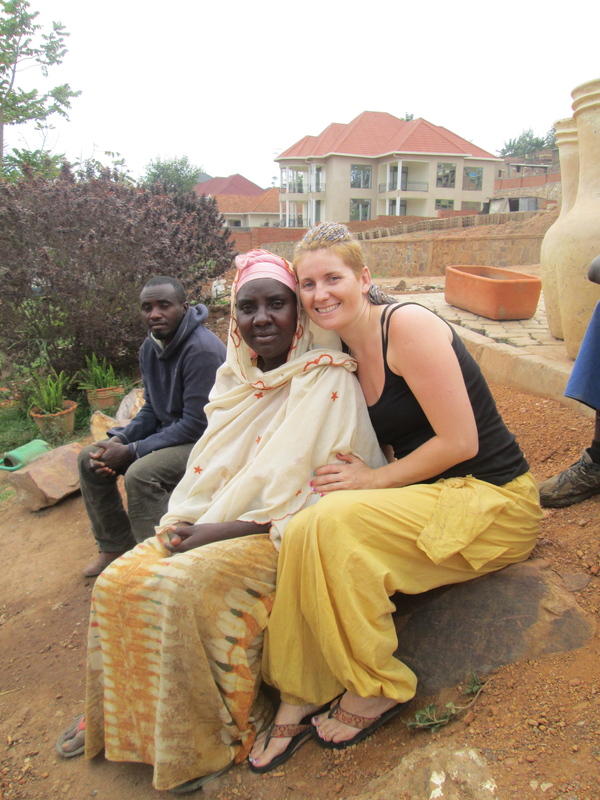 I have set her up with Alice (Justin’s wife) as she is a social worker whose focus is HIV patients and she has a deep heart connection to the work. We have plans to meet and get Alice’s expertise but have had to postpone as we are both feeling a bit unwell. I am so happy to be able to connect Alice to something I am involved with and for her to be a part of a project even when she is at home with baby. She is happy to be involved. As look back at the highlights I see how much good, how much light, joy and love there was sprinkled into my time at Ivuka and if I hadn’t gone there most of these things would not have happened. There is always a bright side to even the darkest moments and this is my way of honoring them and giving them as much energy as I do the other side. Balance does exist if I decide to see both side as equally valuable parts of the equation. Glad its over though! Happy to be right where I am! Om Siva! Nicw pictures Amanda… you look very good and still quite white haha!!! thought you’d be burnt black! !